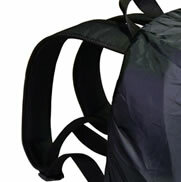 Free to film with this compact backpack with its padded and contoured shoulder straps. 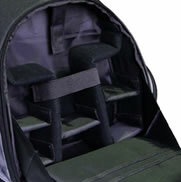 Carry a wide and varied range of accessories securely with the many layouts available. A robust, durable case that will last, constructed from high quality materials, with the GEM 10 Year Limited Warranty. Protect your gear from dust and moisture with the weather cover, in its own section. There are four important factors you should consider before choosing the correct case for your Compact System Camera, which in turn will allow you to make full use of your camera. Does the case allow you to carry your camera and accessories comfortably? 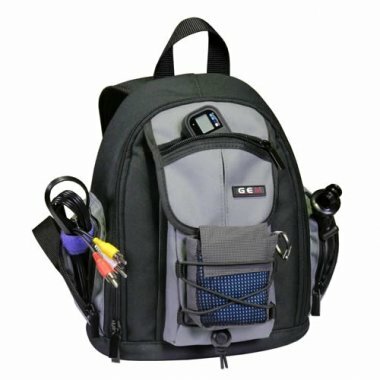 Is the case practical to use when out on location with your camera? Does the case offer your camera and accessories a secure surrounding? Will the case keep your camera and accessories safe? Whatever your sport, pursuit or passion, so that you are free to film with your Compact System Camera, any accessories or spare lenses that you are not using will need to be carried as if they were not there. For this reason GEM opted for a compact backpack that is out of the way, easy and comfortable to carry, with padded, contoured and adjustable shoulder straps. The case is full of features to aid practicality, with to many too list, but here are a few. You are not limited to the different types of accessories you can carry, as in the main section there are moveable dividers that can accommodate and secure different shapes and sizes of accessories. Some items will need to be accessed quickly such as spare batteries, memory cards, etc. For this reason there are four pockets on the exterior of the case which are quick and easy to access so you don't miss that all important shot. To prevent your camera and accessories becoming damaged, GEM has built in various design features to reduce the possibility of such damage occurring. One such clever feature is the Anti-Spill Flap. When you open many backpacks the contents have a tendency to fall out. The Anti-Spill Flap sits behind the main access panel of the case and simply needs unfastening after opening the main compartment. 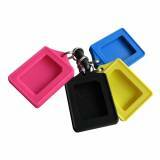 Although simple, it keeps the contents of the case secure even after the main section of the case has been opened. It even has a nifty storage section for even more accessories. Throughout the case for added protection, many of the internal padded sections of the case are reinforced with plastic strengthening boards, giving the case extra rigidity. To keep those important accessories dry such as memory cards, batteries, etc., and to protect the case from dust, in its own special section of the case there is a weather cover. With its own special section, this means that when the cover is stored it does not contaminate your camera and accessories. There are many more aspects we could cover, but you will discover these once you receive your GEM Titanium Backpack for your Compact Camera System, with its 10 year limited warranty and no quibble returns policy. 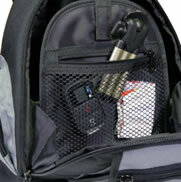 So to prevent your camera and accessories getting damaged, get the GEM Titanium Backpack to protect them straight away. In the unlikely event you did find the case did not match your needs, you can simply return the unused case back to us for a full refund.